If the shoe fits and you're a single female seeking to travel to foreign lands and especially to explore the beauty of South East Asia, it could possibly come with a fair amount of risks and uncertainties. But with the right attitude and foresight you can undoubtedly travel in relative safety within any of these regions including some amazing places in Thailand. So for all single females out there who simply love the absolute freedom of travelling alone in strange but wondrous places, make sure you do as much research as possible beforehand to customise and familiarise yourself with the cultural aspects and rules of the road you'll need for the places you are about to visit. Arming yourself with as much knowledge and information as you can about safe travel for single females in Thailand will certainly go a long way in helping you solve any potential problems or threats you may or not face along the way. 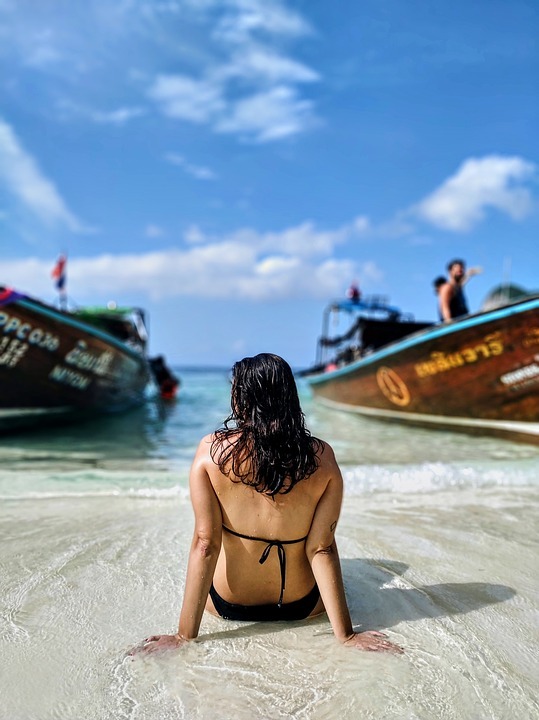 If you are a single female travelling to Thailand, then you should know that Thailand is one of the safest places in the world for a female to travel on her own. Not only is it a wonderful piece of paradise to have a vacation, what with all the lovely beaches and awesome shopping experiences, but it's also a great place for a solo female to stay for any length of time. You may even want to linger a lot longer. However, there are some useful tips which you should be aware of while travelling alone to Thailand so as to remain safe and unharmed at all times. For instance, you should be wary of walking alone on any beach at night since there could be the possibility you might be mugged or even raped, though the latter is extremely rare in Thailand. It is recommended that you take care of your bags and belongings on train journeys and that you do not consume too many alcoholic drinks either. Thailand, formerly known as Siam, is the center-most country on the Indochina Peninsula in South East Asia. With an estimated population of around 65 million as of 2013, it is the world's 20th most populous country and the ninth most populous in Asia. Thailand shares its border to the north with Burma and Laos, to the east with Laos and Cambodia, to the west with the Andaman Sea and to the south with Malaysia. Bangkok, the capital of Thailand is one of the safest places to visit and live in the world and especially for single women. Other places which are equally safe for single females to visit in Thailand are places such as the city of Chiang Mai in northern Thailand, anywhere along the southern shores, on islands like Koh Samui and Phuket and also all the national parks in the country. The only exception to the rule is perhaps the very southern regions near the border of Malaysia. Other than that it's safe. 1) Make an all out effort to blend in as much as you possibly can. And by that I mean, try your utmost not to look like the average tourist. (That may not easy if you have blond hair) If necessary tell locals and other foreigners that you are living in Thailand indefinitely. 2) Dress modestly and remember to wear long sleeve tops with long dresses and or trousers when visiting religious sites in Thailand. 3) Please don't walk around with lots of jewellery especially the expensive sort and certainly not any of that awful bling-bling type. 4) Don't carry expensive brand named bags emblazoned with easily identifiable logos. If you're a photographer, carry only what you need and not too much other baggage. 5) If you are getting too much unwanted male attention in rural regions and have blond hair, cover it with a bandana or a sarong. 6) Take plenty of sunscreen with you. Comfortable footwear and a hat would also be a good idea and don't be afraid to use any of them. 7) Stash your cash in your bra so that you always have money in case of emergencies. If you're wearing socks, you can hide cash there. 8) If you're on medication, make sure you have adequate supplies and if necessary carry a well-stocked first-aid kit. 9) It might be advisable to invest in a good travel insurance package that will cover you in the event of not only the loss of property but also adequate insurance to cover unforeseen medical emergencies. 10) You may also want to pack in a few condoms just in case. You never know when one may come in handy. Western safety standards are possibly a lot better than in most Asian countries. Isn't it strange that Thailand produces many of the world's consumption of condoms? There is one final tip and although it's highly unlikely, you should via phone, email or otherwise, let a friend or family member know your whereabouts and when you're likely to return. That's just in case you do somehow get lost and are in need of some kind of assistance or rescue. A well-travelled guy called Earl at wanderingearl.com who has journeyed solo in over fifty countries and meets single female travellers all over the world, in every single country he has ever been to, has this to say.... As long as you use the same common sense while travelling that you would use at home, the chances of anything unforeseen happening are quite slim. He goes on to say that there’s no reason to believe that every country presents a greater danger to solo female travellers than in your own country, He also says you’ll find most places you visit will feel a lot safer. Before I wish you all the very best on your trip to Thailand, I would like to introduce you to someone who has produced what is probably the ultimate blueprint for a safe and inexpensive way for single people to travel the world. This instructive guide No Debt World Travel doesn't explicitly focus on safe travel for single females in Thailand or is it written by a female, but it is an extremely informative guide for any single person wanting to travel alone in an unfamiliar country. What it does do well, is dispel the common myths and misconceptions about solo travel. It also covers things like how single females can travel to exotic countries like Thailand safely. How to get cheap airfares. How to budget. Price comparisons. Where to stay. How to stay healthy. What type of climate to expect. Customs, etiquette and so much more. Should you decide to purchase this guide you'd also be helping me earn a small commission so that I too can continue my solo journey around the world and that would be simply amazing. Just click the link above.